It was the last day of the river season and I had been getting more and more excited as the week wore on, thinking about where I was going to go and what I was going to do. Unfortunately the weather had other plans. 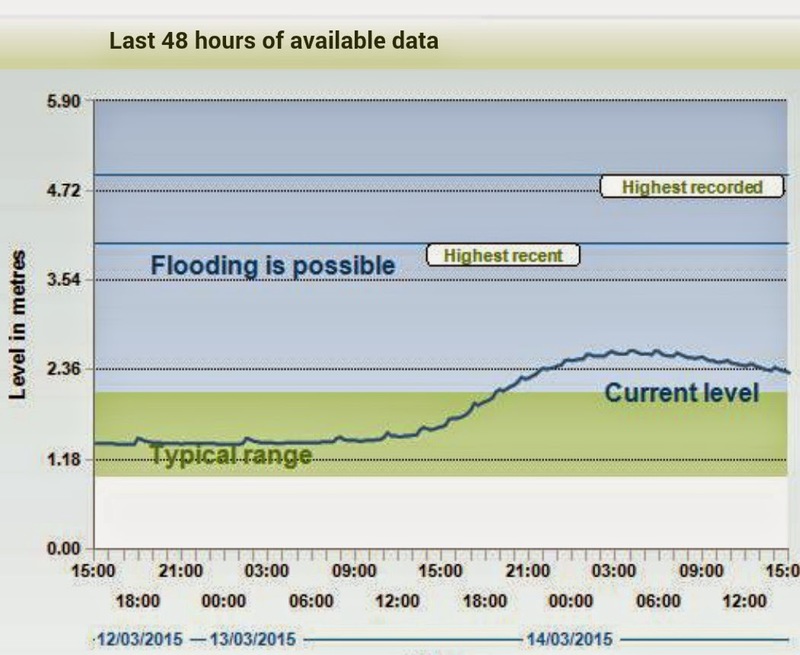 I checked the EA river levels website before I left and saw the ominous spike, but I still left with my gear and hoped to find somewhere that I could tuck myself away. The river was very high all day! 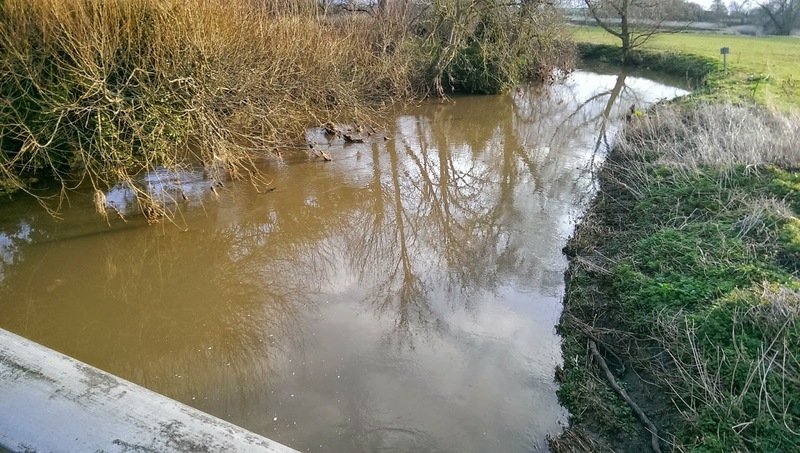 The constant rain from Wednesday onwards meant that when I arrived at the river at Hambridge, I saw straight away that I wasn’t going to fulfil my plans of fishing the river. It was as high as I had ever seen it this year (although it has been much higher), and looking over the bridge and down at the bank, the bankings were water logged and were an inch or three under water. Getting back to the car I had a re-think of my plans and decided to give Dillington Pond a bash instead. What an absolute palarva! It seemed as though all the roads and lanes leading to Dillington were shut. In the end I went on a 20 minute detour before re-joining the correct road and finally making it to Dillington just after half 8. I was surprised to see the lake completely empty! Win! Before anyone else arrived I made a beeline for peg 24 – The pump house swim. I have always wanted to fish this swim, but it’s usually always taken. Apparently all you need to get on it is a miserable, cold and windy day in late winter! 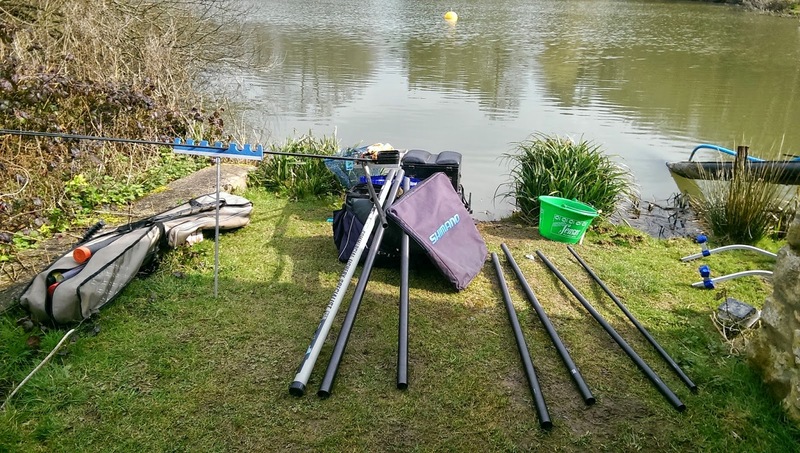 I knew there were plenty of fish about, having read Jamie Rich’s most recent blog and was also aware of the lakes resident hooligan – Which proceeded to make one hell of a racket when I pulled my gear through the gate. I was only going to be able to fish for a few hours before heading home for the Wales v Ireland match in the afternoon, but decided to use my keepnet for the first time in years. I threw my net out and returned to setting up my top kits when I felt my footplate shaking. 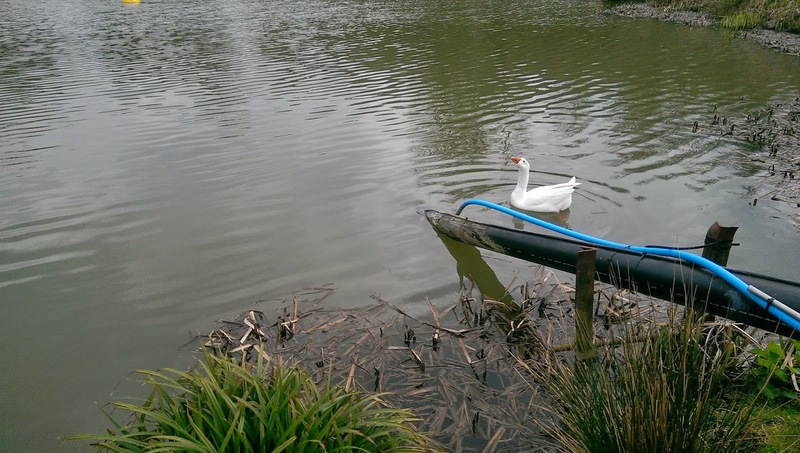 I turned around and saw the ruddy thug of a goose attacking my empty keepnet! He wasn’t even perturbed when I prodded him away with the end of my landing net handle. Do you recognise this thug? Loose Solid 8 elastic – 0.4g Rizov float, 2.68lb Fox Micron line straight through to a Kamasan B911 Size 16. Loose Solid 10 elastic – Same rig as above. Solid 14 Elastic – 0.4g NG Float, 3.12lb Fox Micron line straight through to a Kamasan B911 Size 16. After the Goose decided he’d finished bullying my gear I began plumbing up. I was really surprised how deep the pump house was. My rigs were just deep enough to fish the bottom under the tree on my left, but there was no chance of fishing dead depth out in front without making rigs on the bank (which is not something I fancied doing). It was a bit of a hit and miss day really. For some reason, all my casters had turned to floaters – I did nothing different to how I normally keep them, so was quite disappointed when I found them like this. Also, thinking I was going to fish the river I had no pellet, meat or corn with me, and on inspection of my worms, they had disintegrated! I never have much luck keeping worms any longer than a month… So today was going to be a maggot only day. I mixed up some brown crumb and River 3000 (fortunately the species it attracts are all present in Dillington – aside from Dace) and potted in 2 balls, positioning my hookbait over the top. 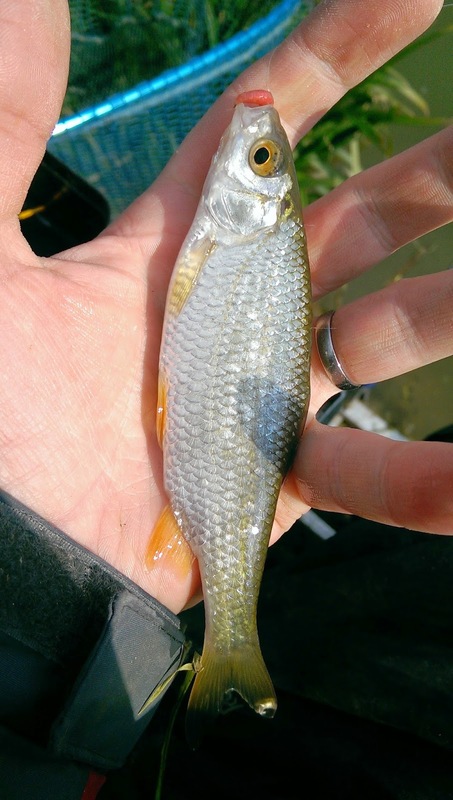 The bites were quite slow to be honest, but after a bit of movement did I incite a bite from one of the ponds resident Roach. A small roach of a few ounces, if the bait stayed stationary on the deck for longer than a minute, it would be picked up by a perch. 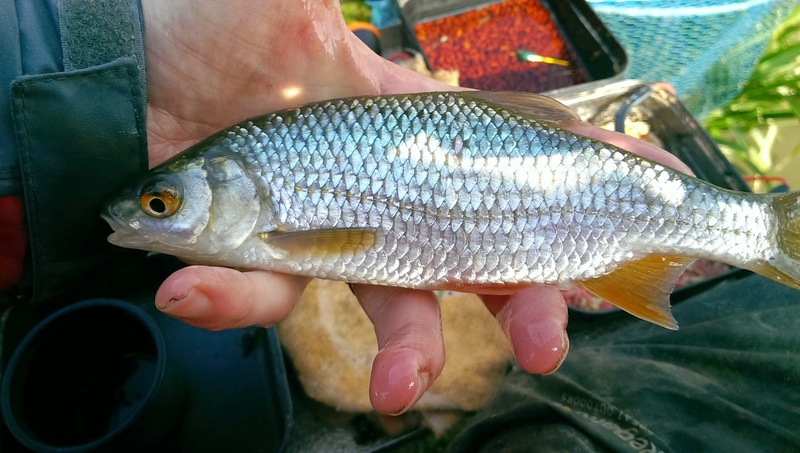 Lifting and dropping the bait would get a bite out from Roach almost instantly, but hitting them was proving difficult, and costly. To get more positive bites I had to get my rig almost under the tree. Anything other than a strike straight rig could potentially result in catching a branch! I altered my shotting pattern to dot my float tip down and opted for an “on the drop” style, this resulted in more positive bites, and soon I was bringing a steady stream of fish to the net, including a few netters. After half an hour or so my swim went completely dead, I fed over the top and dropped another ball of feed in but still no bites. I switched (knowing I couldn’t reach the bottom) to fishing the open water. The bites were incredibly fast and very finicky, and striking them was also proving difficult, but I was reluctant to start making rigs with smaller hooks on such a cold morning. I managed a few roach and perch before switching back to the swim under the tree. Then the thug came cruising by, this time from around the other side of the tree – Like a thug Goose ninja! The goose cruised by eyeing my suspiciously and made to bite my top kit (which he fortunately missed) before safely positioning himself about 15 feet away for 10 – 15 minutes. Making an enormous racket and occasionally hissing in the process. Eventually it got annoyed with the buoy in the middle lake and paddled out towards it for a tussle. The fish seemed to have returned to my tree swim and I was slowly putting a small bag of fish together, but they were inconsistent, both in sizes and bites. It was around 12ish when my swim really died and I popped on 3 dead maggots in the hope that I could pick up a stray bream. Sadly what I picked up was a perch not strong enough to pull my float under. Greedy little swine. I began clock watching at 12.15 as I needed to be back and on the sofa for 2. 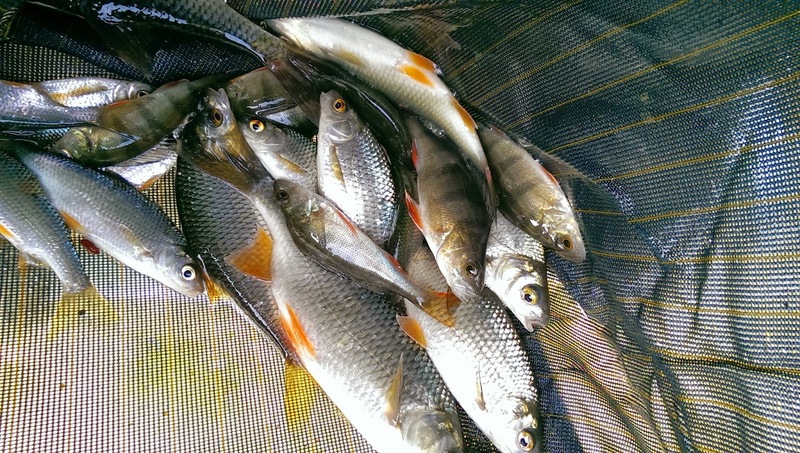 I pulled my keepnet out and only decided to photograph my catch when I had put half of them back in the lake! (Was thinking about the rugby). I think I hit double figures, but would have had more had the fish been on the feed from start to finish. 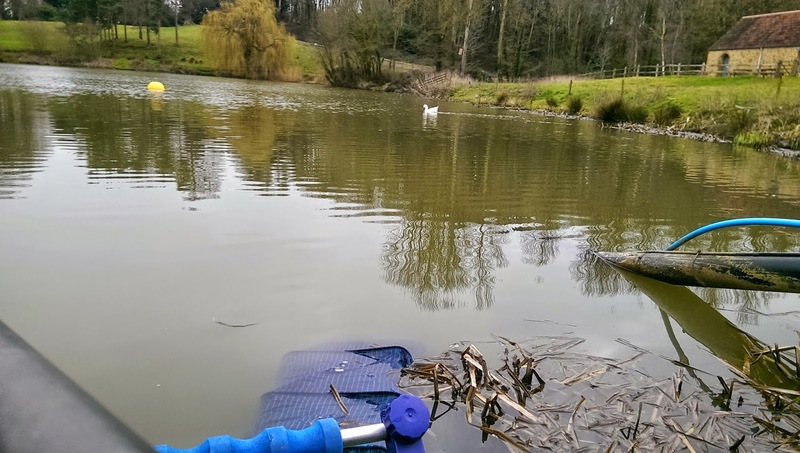 I always enjoy fishing Dillington Pond, regardless of the weather you will always catch and if you are happy to catching small(ish) fish, you will catch all day. I am looking forward to trying the lake in the summer for some of the resident slabs and may even take my father in law there when it warms up as he it yet to catch a tench and they almost always put an appearance in when you use the right baits. I am also seriously considering the summer league this year, but with several friends all “tying the knot” at various points on various weekends, committing to the entire league may prove difficult. Until then I will definitely returned to target better bags of silver fish. Re: keeping worms. With dendrabenas, I find slicing an apple into about 6-8 pieces, giving them that, and keeping them in a hessian sack to be best. I've kept them for 4months and more this way. Obviously just keep them somewhere cool and dark too. If they get any groundbait on them they'll die within a day or two. Hope that helps. Lobbies won't last nearly as long but I've kept them a month in either a big bait tub or hessian sack. I feed them mash potato and some grass cuttings. Hi Russell, thanks for your info. Anywhere local I can get an Hessian sack? Does the sack have to be damp? How much soil would you put in the sack? Would compost be ok? Isn't apple too acidic? I know they love butternut squash peel. Hi Paul, I always buy my worms by the kilo, so they come in a sack anyway with a ton of dirt. Apple is fine, I've done it loads of times and worms have lasted 4+ months often. If you can keep them then buying a kilo at a time makes perfect sense cost-wise. In fact, I can't remember the last time I had a single worm die on me! I use dendras all the time one the canals – wouldn't be without them.